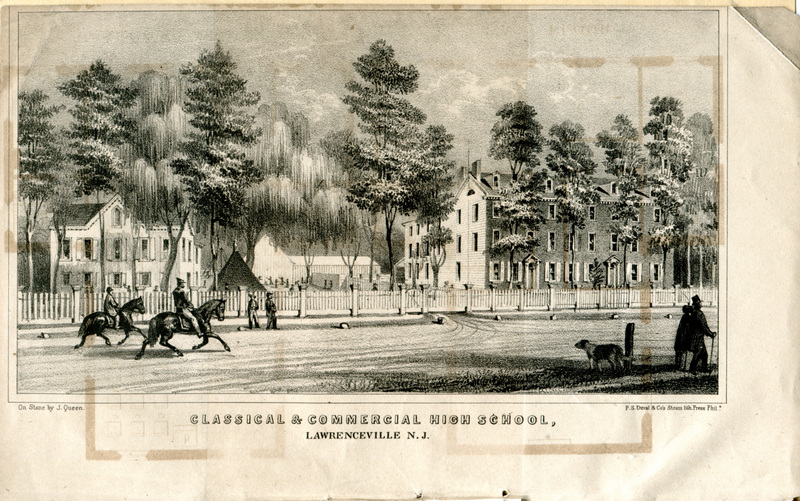 The 1852 Catalog of the Lawrenceville School helpfully included a floor plan for the “school house” — the building today known as Haskell House, which served as the main classroom building from 1832 until Memorial Hall (now Woods Memorial Hall) was built in 1885. Hamill House, built in 1814, was where boarders lived. Below you see the exterior of the School House on the left and what is now the Hamill House on the right. As you can see from the diagram of desks, the teacher sat at the back of the classroom (marked a) where he could keep an eye on the students. Periodically the Stephan Archives will discover that it has gaps in our collections. We will be posting those gaps as “BOLO”s (Be On the Look Out in old police terminology) in the hopes that our users might have such items in their personal collections and be willing to donate them to our institution. Please contact Archivist Jacqi Haun if you have any of these items in your personal collection and are willing to part with them. Thank you!